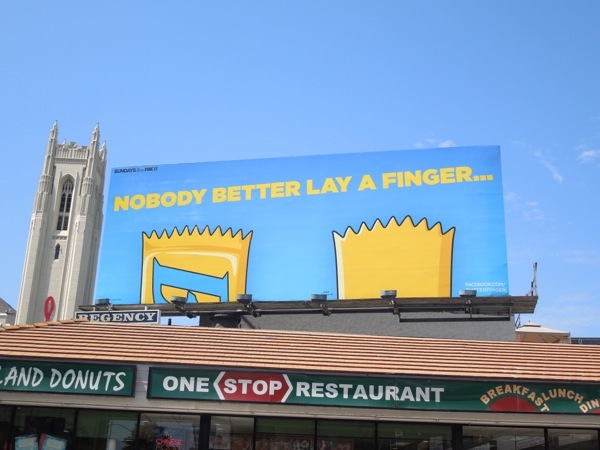 When Daily Billboard first saw this billboard for Butterfinger candy, the first thing that came to mind was Bart Simpson's hair, which is obviously a good association to make. 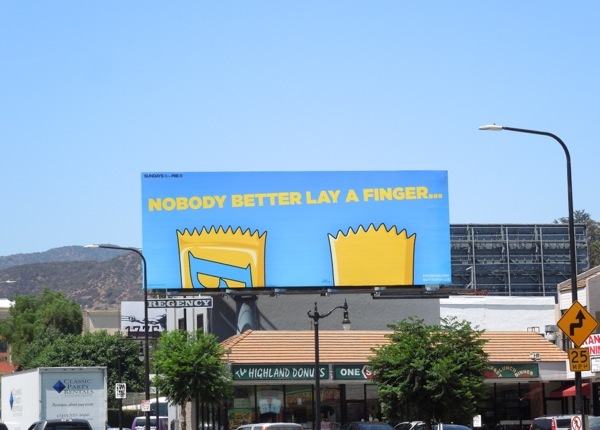 The funny thing is that Daily Billboard has only been in America for five years, so was unaware of the rich history the confectionary brand has with Matt Groenig's animated TV series, The Simpsons. Little did we know that the chocolate brand and the dysfunctional cartoon family have shared a close working relationship since the late 80's in the form of TV commercials, product placement and other advertising. 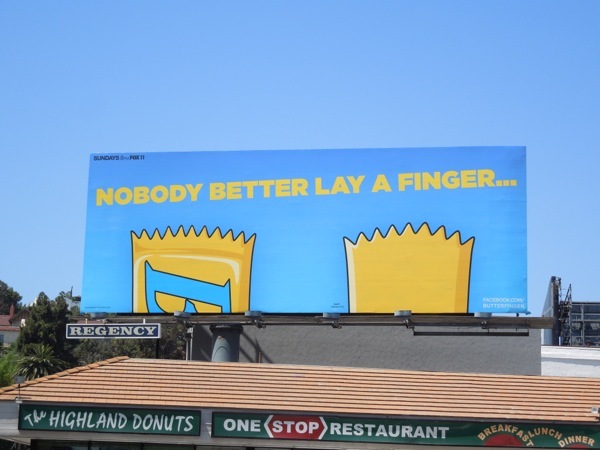 But as you can see the advertising endorsement has returned, along with the 'Nobody better lay a finger...' slogan. 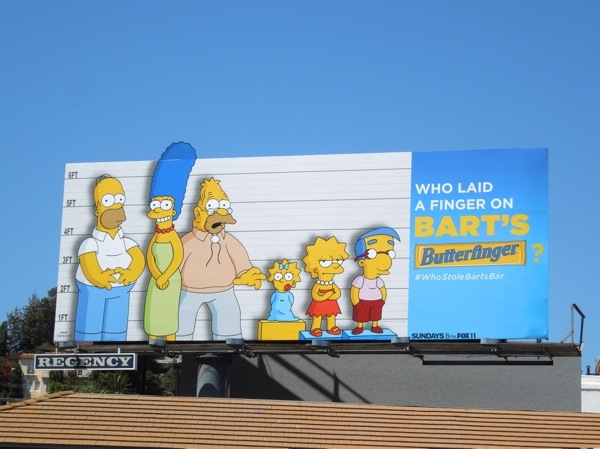 This fun and bold Butterfinger billboard was spied along Highland Avenue in Hollywood on July 7, 2013. It's also a testament to Nestlé's confidence in the candy bar's recognisability and brand strength that it doesn't feel the need to plaster a pack shot, or complete logo, all over the ad for people to know what it's for. 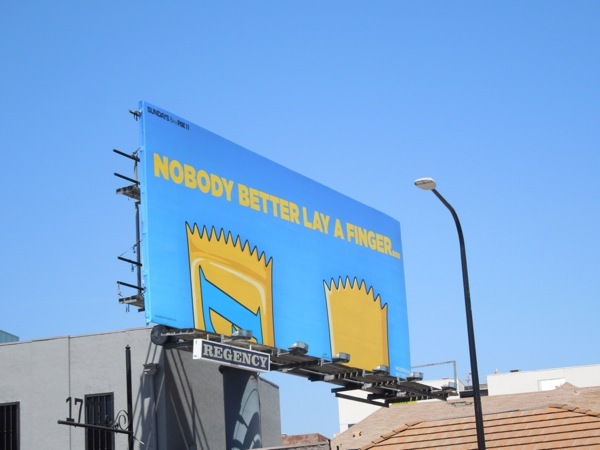 The only problem now is that Daily Billboard's mouth can't stop watering, contemplating all the peanut-butter and chocolate goodness that awaits. 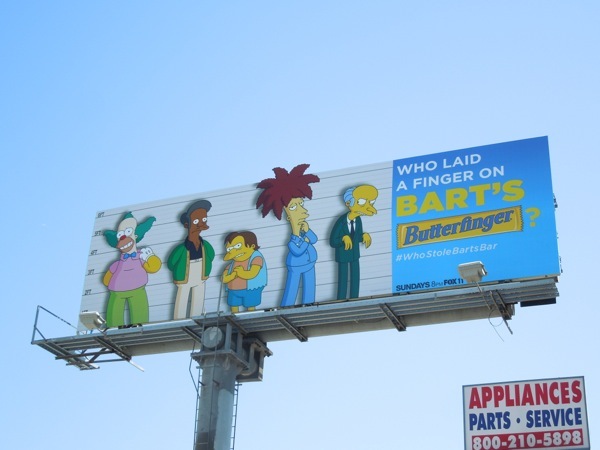 UPDATED: First came the teaser billboard, then came these fantastic 'Usual Suspect' ad creatives (in an homage to the Bryan Singer's 1995 film) to answer the question of who laid a finger on Bart''s Butterfinger from The Simpsons large cast of characters. It appears that no one is beyond consideration, from his siblings 'Lisa' and 'Maggie', to his parents 'Homer' and 'Marge', and even poor old 'Grampa Simpson'. Then there's the slightly more suspicious folks like 'Krusty the Clown', 'Sideshow Bob' and 'Montgomery Burns'. Who do you think the culprit is? 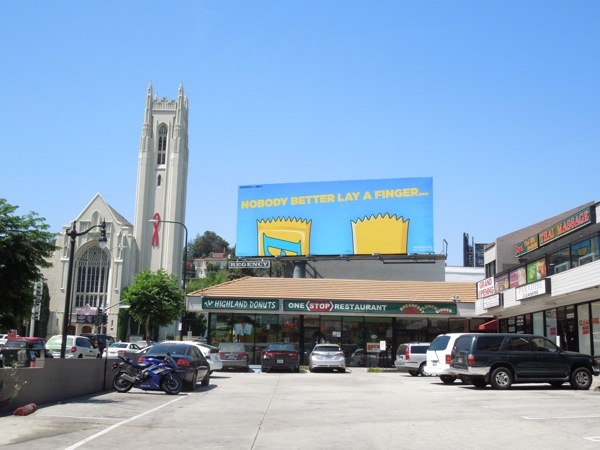 The Simpsons family billboard was snapped in the same location as the 'Nobody better lay a finger...' teaser and the other diabolical cartoon character creative was spied in close proximity along Highland Avenue opposite Hollywood High School on August 8, 2013, also replacing the same teaser ad. 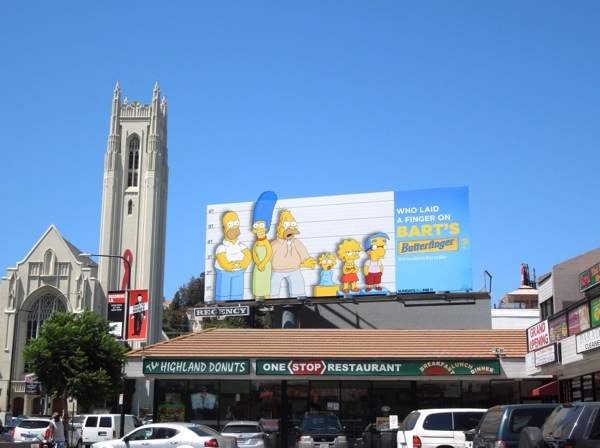 This candy campaign is such fun and Daily Billboard loves how both Marge Simpson's and Sideshow Bob's hair peeks over the top of the billboards as an extra detail to catch your eye.